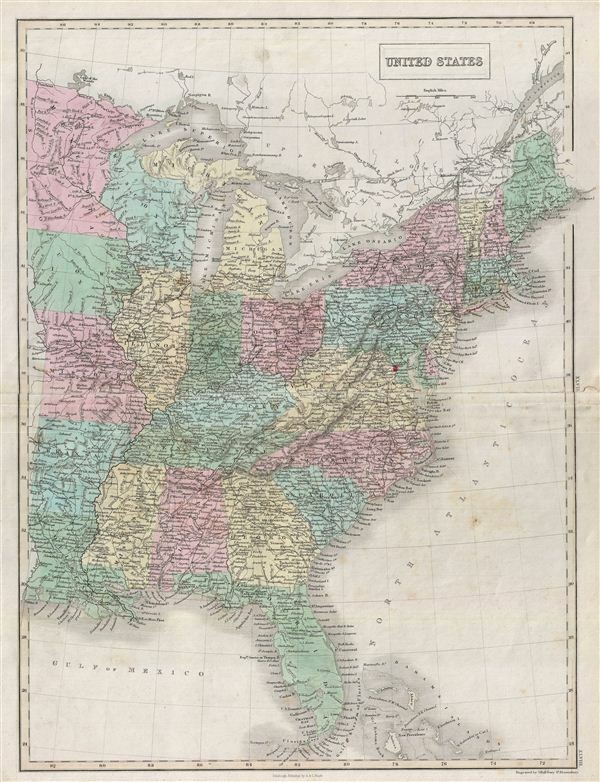 A fine example of Adam and Charles Black's 1849 map of the United States. Covers the populous eastern portions of the United States from Lake Superior in the north to the Florida Keys in the south and from Missouri in the west to Maine in the east. The United States at this time was witnessing a period of rapid expansion. With the rise in territorial population to the west of the Mississippi, the eastern states were becoming increasingly divided over the issues of slavery and state vs. federal sovereignty. These tensions would grow over the next 11 years culminating in the American Civil War. Throughout, the map identifies various cities, towns, rivers, lakes, roadways and an assortment of additional topographical details. Map is hand colored in pink, green, blue and yellow pastels to define state boundaries. The map is engraved by S. Hall and issued as plate nos. XLVII and XLVIII in Black's General Atlas. Very good. Overall toning. Original platemark visible. Verso repair along original centerfold.